Congrats are in order for Canada, as the Senate has just passed the marijuana legalization bill! America has always needed to take notes from Canada, but today they are truly a country to look up to. Tuesday (June 19), Canada’s Senate voted 52-29 to allow adult recreational use of cannabis! 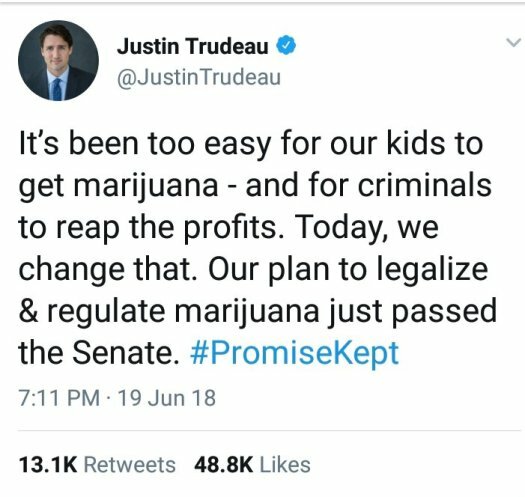 When Prime Minister Justin Trudeau was campaigning in 2015, he ensured his administration would make legalization a top priority. As the legalization bill’s ink dried, Canadian officials announced that adult-use sales would start September 1 of this year. Just yesterday, however, the country’s Minister of Health announced that sales will begin October 17, 2018.